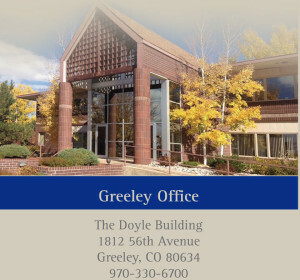 OBP has offices conveniently located in both Greeley and Loveland. From I-25, exit onto US-34 (Exit 257) eastbound towards Greeley. Travel eastbound on US-34 for a total of about 11.5 miles, passing the Promenade Shops at Centerra. Continue straight past County Road 17 and the Highway 34 Business Route. Continue straight on US-34 until you reach the traffic light at 65th Ave., with Pope Farm Produce and Garden Center on the northwest corner. Turn left (north) onto 65th Avenue, and follow the road about one (1) mile as it curves first to the right and then to the left, becoming 59th Ave. Turn right at light at West 20th Street, heading east. Go just up the hill, passing Work Out West, and then, before you reach the top of the hill and the water tower, take the turn left onto 56th Avenue. Our office is a two-story red-brick building located about a block down the street on the right (east) side. Look for the sign for The Doyle Building. We are located on the second floor. 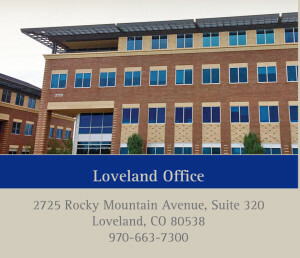 Located in the heart of Centerra on Lake Equalizer, our Loveland office has spectacular views of the lake, Old Canal Park and the Rocky Mountains. From I-25, exit onto US-34 (Exit 257) westbound. Travel west on US-34 and turn right at the first light onto Rocky Mountain Avenue. Follow Rocky Mountain Avenue through four roundabouts, continuing past the outlet stores and Medical Center of the Rockies, to East County Road 24, stay left through the fourth roundabout and head towards the office buildings on the west side. Turn left into the parking lot. Our building (number 2725) is the second building on your left in the main parking lot. Take the elevator to the third floor.